Today’s snowfall may not have closed the City schools but it brought the third activation of PlowNYC. Developed at the request of Mayor Michael Bloomberg, and in collaboration with the Department of Sanitation, PlowNYC is a web-based mapping application that shows DSNY snow operations progress. Streets are color-coded into time slices that represent the last time a street was serviced by a DSNY vehicle (plow or spreader). Figure 2 shows the time slices and the colors that represent them. Thus, in this case, streets with a color of green have been serviced in the last hour. Global Positioning System (GPS) data are received from each equipped DSNY vehicle and transmitted to the operations center. The data is then coded to the street segment it falls on, with the time stamp of the GPS location. The streets are then processed to determine which time slice they fall within and then rendered as map tiles. Due to the large amount of time required for data processing and map generation, the map is refreshed every fifteen minutes. The last and next update times are shown in the header. In Figure 1, the last update was at 9:45 am with the next update at 10:00 am. New for this activation is a mobile-web version. Upon loading, individual devices are determined and the appropriate version of the application is served to the end user’s client (web or mobile). The mobile web version is accessed via the same url http://maps.nyc.gov/snow. Figure 3 shows how the application appears on an iPad. 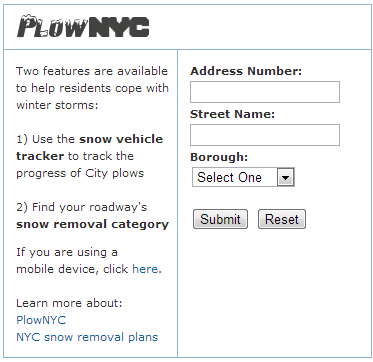 PlowNYC is also accessible from the Office of Emergency Management’s Severe Weather site. the search form shown in Figure 4 is available during a PlowNYC activation. 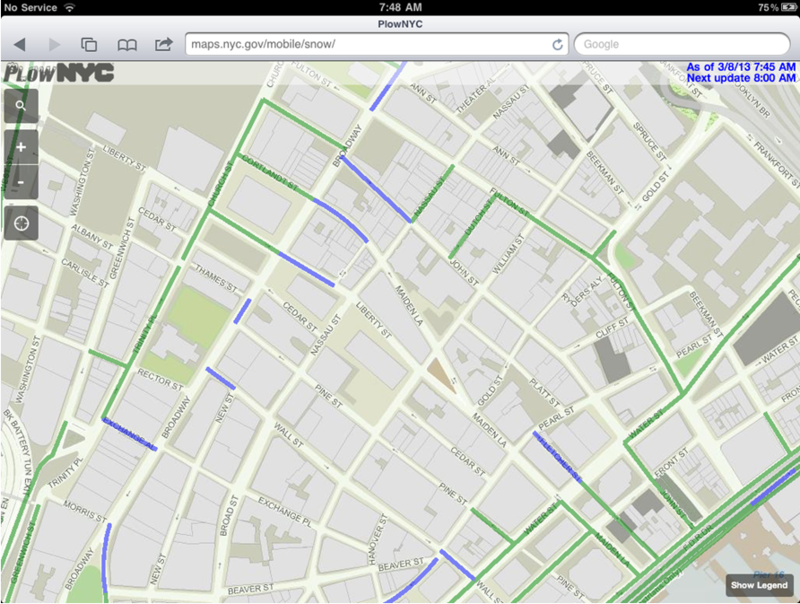 PlowNYC shares many of the same components as NYCityMap. Geoserver and GeoWebCache are used to access and render the data as tiles. The mobile web version uses OpenLayers.